Are you tired of constant inflow of software updates that require your attention and time? Well, you are not alone. While timely security patching plays an important role in providing a secure enterprise IT environment, dealing with patches as they are released at an unmanageable rate, seems to be an overwhelming task. 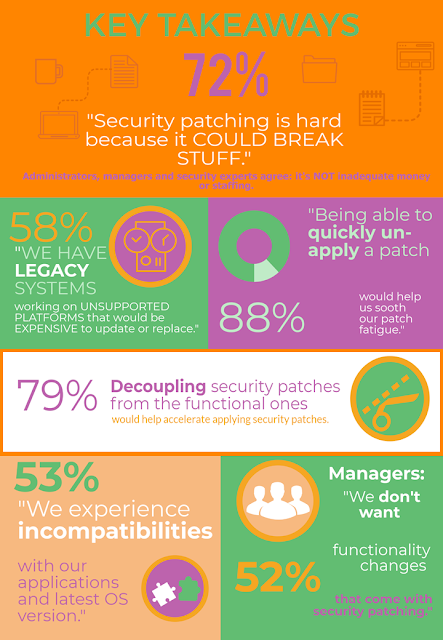 We are presenting our first Security Patching is Hard - Survey Results 2017, revealing struggles and obstacles companies and individuals deal with when they try to be up to date with security patching. The survey was inspired by security experts that opened a debate over their patch fatigue after the Equifax leak. For the first impression on survey results check out the infographic of the key takeaways. There is one obvious message from our research: the process of software patching should be simplified. For a dive into the facts and numbers behind the security update gap, download the report. It reveals the main reasons for the patching fatigue, the impact of legacy software and how the relationship with software vendors influences the pace of applying security updates.